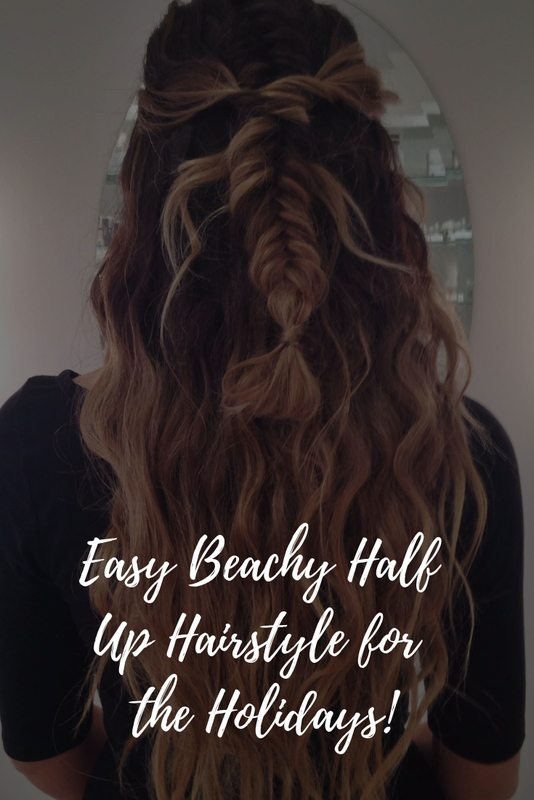 Easy Beachy Half Up Hairstyle for the Holidays! Don’t forget, you can always do the half updo more cleanly than I did if you prefer that look! I will totally wear this for parties this season, but if you prefer more elegant hairstyles for parties, feel free to wear this day to day :)! I absolutely love this hairstyle and will definetly be trying this! how do you get loose curls if your hair takes to curl very well. even if I have my iron on a low setting i still get very tight curls. Can you do a tutorial for Elsa's hair from Disney's new movie, "Frozen" ? 😀 Pretty please. That is totally cute! Gonna have to give it a shot. your hair is just BEAUTIFUL! 🙂 i especially love the highlights in your hair! they make each look just perfect! unfortunately i cant do the same since i have bright blonde hair. That would look good with a four strand braid too….and shaking them out is useful to know! Favorite! I'm definitely going to try this! I have so many holiday parties coming up 🙂 Thanks, Kayley! Gonna try a version of this today! I adore how you edited this time. Very nice idea Kayley! What wand did you use?? Where did u get your top from? Could you do Elsa and Anna's hair from frozen!?!? Such a cute movie!! I love Kayley, but lately I feel like there hasn't been any new or exciting hairstyles that i want to try, I miss the old videos when I wanted to try every single one of them. You're gorgeous and I think it's time for a stunning make up tutorial, like the one from the wedding look. Congratulations on your first year of marriage, btw. I love it! Simple yet elegant! I'm doing this tomorrow, thanks! Do you know how to achieve heatless curls that start from the roots? If so, could you do a tutorial on it, please? thank you so much for this curl pattern! i'm going to be watching the Victoria secret fashion show tomorrow , and when ever i watch something like a t.v show, or movie i always like to do hairstyles inspired by it, and you have given me just that! you are the best!